I hope everyone experienced an especially joyous and blessed holiday season. One of my New Year intentions is to share with all of you more often, so I’ll be writing again soon to tell you about some amazing opportunities and events I’ll be offering in 2012 – including a Miracle Journey to Peru. With the holiday season behind us, there is a lot of news circulating about how many people are buying eReaders like the Nook, the e-ink Kindle, the iPad, and the new Kindle Fire. I was shocked when I saw the numbers. I recently read that over 1 million Kindles alone are being sold every week in the US, and that’s not even including iPads and iPhones with Kindle apps! This means that lots of people, just like you, are going to be on the lookout for great books to read on their new devices. It looks like I may be one of the few people on the planet who doesn’t own a Nook or Kindle now. 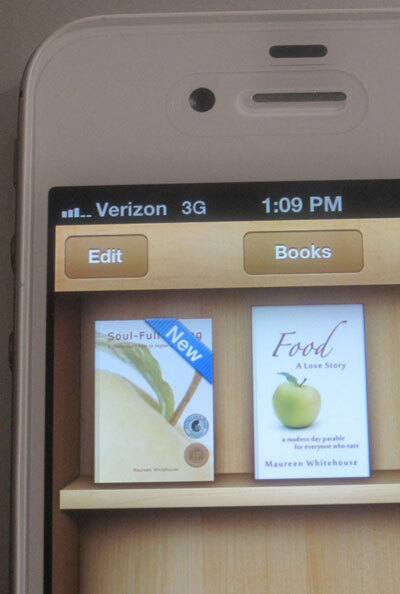 I admit, though, that I have joined the ranks of those who are testing the eBook waters – via a favorite new addition to my life, the iPhone 4S. Not minutes after I turned it on for the first time, I added the first two titles to it’s empty iBooks library shelf – my own! – Soul-Full Eating and my newest release, Food: A Love Story. I love being able to carry them around with me in such a compact way. So in order to allow as many people as possible access to my new book, Food: A Love Story with their e-readers, I’ve just made it available for a limited time at just $2.99. It will soon be listed at $9.99, but it’s my goal to inspire and liberate as many people as possible, as early on in the new year as I can, so take advantage of this offer yourself and then please do share this offer with your friends and loved ones. In case you are not yet familiar with the book, Food: a Love Storyis just that, a love story. One which will give the countless millions who are typically focused on New Year’s diet resolutions and post-holiday weight loss something infinitely more satisfying to chew on than a bland and dissatisfying diet plan. It is written as a parable, much like Paulo Coehlo’s The Alchemist, but it focuses on food and its impact on our relationships and everyday lives. habits to find the perfect weight. The seemingly ordinary “life coach” who agrees to take Kate on as a client, has more than Kate’s waistline in mind. This unconventional approach is a complete overhaul of body, mind, and soul, causing Kate to question some of her most cherished beliefs, and let go of past regrets along with mealtime baggage. As Kate’s mentor guides her into unknown territory, they uncover an aspect of eating Kate had long ago forgotten-joy. Throwing all rules and restrictions out the window, Kate is led by one simple principle, “Eat with love, what’s grown with love, prepared with love and served with love.” A warm-hearted and fiercely direct dialogue ensues, as the two women clear Kate’s kitchen, assess her wardrobe and uncover a brilliantly confident woman that Kate never realized was hiding under her own skin. Enjoy your first hours and days of 2012. What a wonderful year we can make this be! I look forward to sharing much joy, creativity, adventure and miracles with you in the coming months. Did you know that you have a powerful personal map that reveals your life’s journey? You do! When you plot points on this map and discover all the archetypal landscapes you’ve been through, YOU become the mapmaker with the ultimate capacity to shape your destiny. Right now in the United States farmers are being rewarded by the government to plant fence-row to fence-row. In other words, some government subsidized farmers are leaving no grassy land between crops and water – which not only causes serious soil erosion, but renders water undrinkable and our oceans unfit to swim in. One striking example is The Dead Zone in the Gulf of Mexico. This video from the Environmental Working Group stresses that it’s time the US government enforces the law that requires farmers to put conservation practices in place in exchange for the billions of dollars in tax payer income and insurance subsidies they get every year from tax payers. I’m joining the fast – are you? I have lots of experience with fasting. I’ve typically done extended fasts – for 10 days or more – at least twice a year. And I often fast at least one day a week. So I know the experience of fasting need not be debilitating and exhausting but can actually be not only invigorating, cleansing, but centering and clarifying to the mind and opening to the heart – if done correctly. A brief but comprehensive guide to fasting that I wrote in my book, Soul-Full Eating: A (Delicious!) Path to Higher Consciousness, my gift to you. PS – I’m just finishing up writing a very comprehensive and inspiring Mind, Body, Spirit Cleanse book. Be sure to add your name to my email list to be notified about it’s release later on this month. Spaghetti doesn’t grow on trees… or does it!? BBC pulled a fast one in 1957 with this April Fool’s Day broadcast, which had hungry folks calling in to see where they could get their own spaghetti tree.